Bullying is something that everyone experiences. Whether it's just silly name calling or physical violence, everyone experiences it at some stage. It's not fun, it's not pleasant but it definitely makes you stronger as a person. Like the old saying says, "What doesn't kill you makes you stronger," and they couldn't be more right. If you're going through a tough time, here are a few tips that might help you feel more comfortable. Even though you may feel like punching the bully as hard you can right in the middle of their face, try to avoid it. Don't show that you feel hurt or uncomfortable, bullies gain satisfaction when they realise that they've affected you in some way. All they want is attention, don't give it to them. They're irrational people and it is impossible to talk sense in to one of them. Walk away with your dignity and show them that you're the bigger person. However, if it does continue to happen over a long period of time, stand up for yourself or for anyone else who is being bullied. Do not make jokes at your own expense to try to prove that there is nothing that the bully can do to hurt your feelings. 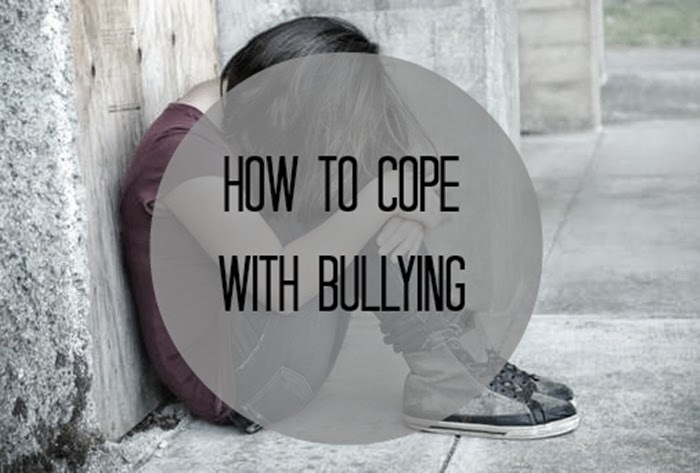 This will only result in you feeling worse and will make the bully feel as if they continue. It will lower your self esteem even further and possibly make you feel humiliated. The one person you need on your side at the moment is yourself. Don't insult your personality or appearance in the hope that they'll go away. Laugh really hard at their jokes, only give them sarcastic responses. You could even create a master plan that just shows how pathetic this person really. A plan so genius that it results in crowds of strangers carrying you off in the distance whilst they cheer your name. Ok, I'll be more serious now. If you're suffering from physical abuse then take a martial arts class, watch some YouTube videos or read a book and learn how to fight back. This stops you from having to suffer any serious injuries and allows you to escape and call for help without being put in an insane amount of danger. You don't need to be an expert at self dense, you just need a few tips. A quick kick in the groin will cause a person to become dazed and confused long enough for you to make a quick get away. If the groin doesn't work, try hitting them under the ribs or on the elbow. Once the person gets embarrassed you can run, hide and call for help. A bully can't get to you if you've got a wall, made up of all your loved ones, around you. They will make you feel safe, secure and provide you with millions of wonderful memories that you will never forget and will replace all the not so good memories created by the not so good people. There is my advice. If you are going through a tough time right now then make sure that you talk to someone. Talk to a friend, a teacher or your parents just so that someone knows what's going on. If you feel like you can't talk to someone you know then check out a helpline such as The Samaritans or Childline. There are so many ways to get help, you don't have to spend your time alone and in the dark. Just remember this, a day spent without a smile on your face is a day wasted. I'm afraid I can't take any credit for this wonderfully written, extremely informative piece. This is the first of the guest posts that will be posted while I'm away. It was written by the lovely Jaimie, you can find her over at Bubblewrap and Popcorn, her lifestyle blog where she posts daily about a range of different topics!